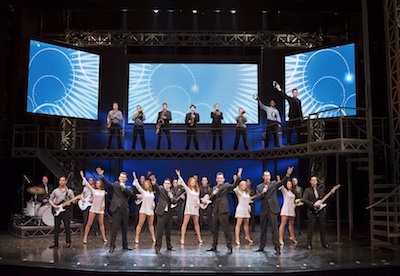 As you’ll see, our experience of “Jersey Boys” was a little different from the nights out at the theatre that we usually write about at View From The Stalls. Firstly, although we’d heard good things, it wasn’t near the top of our ‘to see’ list - but for once the choice of show was out of our hands. Secondly, while we don’t accept press/complimentary tickets from theatres, our “Jersey Boys” tickets came as part of an Olympics trip won through Cadbury/Trebor and entirely unrelated to our witterings here – but we jumped at the chance to include a theatre trip as part of our weekend. And lastly – although on our London trips we do usually splash out on good seats, we don’t normally go for the VIP option with private bar area, champagne, canapés and a personal host for the evening! My musical taste (as in music not musicals) doesn’t really go any further back than the late 80’s so I had my doubts about a musical based on Frankie Valli & the Four Seasons. Fortunately the show recognises the need to deliver a hook for younger audiences and helped by Madcon's recent version of Valli’s “Beggin'” and a French rap take on “Oh What a Night” we’re made to appreciate how the group's influence lasts to this day. And that generates sufficient interest until the characters themselves secure a significant level of emotional involvement. For this isn't a jukebox musical where songs are shoehorned into what serves as a plot. All the performances are 'justified' - the characters don't burst into song in an outpouring of emotion. They only sing when the band is performing. The cast are all top notch, and it's worth noting that on the night we attended Dan Burton played Frankie Valli (usually played by Ryan Molloy) and we would never have questioned that this wasn't his usual role. The show doesn't shy away from the less happy times experienced by some of the group but handles them with sensitivity and avoids shifting the tone too dramatically. It also succeeds in delivering an upbeat ending that doesn't feel overly artificial. Now, as for the VIP element of our evening – well that depends on who you ask. While I very much enjoyed the hospitality provided by our friendly and knowledgeable host, some aspects didn’t sit well with my ‘normal’ theatregoing self - in particular being escorted to our prime seats in the centre of Row G seconds before curtain up and making all those sitting in our row stand to let us pass. Especially when we did exactly the same thing after the interval. I hate people in the centre of rows taking their seats at the last moment and I hated being one of them – even just for one night. Waldorf on the other hand felt no shame whatsoever and loved the special treatment and the glances we received from others in the audience wondering who the VIP guests could have been – although I suspect the two thirds of a bottle of champagne may have helped her in this. And of course it all comes at a price, but even I can’t disagree that if you want a taste of how the other half / one percent live this is a very effective and memorable way to achieve it.